Better late than never, here's Collected Editions' review of Infinite Crisis #1. Yes, this does indeed fly in the face of the whole "wait-for-trade" mission of Collected Editions, but hey, it's a Crisis--what can you do? And, just to mention, this review, as with all reviews at Collected Editions, contains spoilers. It was a little tough to judge Infinite Crisis #1 in terms of Jeffrey's challenge a little while back--that is, since I haven't read any of the Countdown to Infinite Crisis miniseries before this, to try to see if I (and by implication, the general non-comics-reading-but-heard-about-Infinite-Crisis-in-the-New-York-Times public) understand what's going on. Though, as I demonstrated here, I'm hardly ignorant of what's been going on leading up to Crisis. Moreover, there was really little to nothing that I didn't understand, though I imagine a non-comics reader would be completely lost. What struck me initially was the sheer breadth of how the Countdown miniseries affect Infinite Crisis. I mean, that's good--it'd be something of a waste of DC had produced those four miniseries, everyone had run out and bought them, and then they didn't affect Infinite Crisis at all. But at the same time, I think I kind of expected that--or at least, that only one of them would bear directly on Infinite Crisis. Instead, Infinite Crisis #1 cited all four of the miniseries, which was good--except I felt they were visited somewhat heavy handedly, I felt, much like Countdown to Infinite Crisis, where you just knew another miniseries cameo was right around the corner. And were I a non-comics reader, I would be wildly, wildly confused. Even if I understood that the "robot-things" were hunting super-villains, I wouldn't know why they skipped the guy named Nightwing. Or what Batman was talking about when he said "mindwipe." Or who the big green guy was over Gotham City. Or, even, who this J'onn was that Superman mentions--something which probably could have been pretty easily explained. 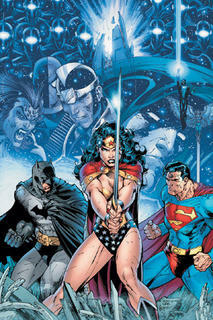 So for me, with a more-than-passing knowlegde of the DCU, I was fine. Someone else, probably not so much. Let me not mislead--I did enjoy it. I felt it was quality super-hero fare, though perhaps standard super-hero fare. Much of it was Countdown references or action scenes--a lot was set-up, but not a lot happened. Much of the Countdown action was recap, and as for the Freedom Fighters--they go to an abandoned location, they get attacked, they get defeated. Set the pins up, knock them down. I think instead I might have liked much of this to be included at the end of JLA: Crisis of Conscience, and let Infinite Crisis start where issue one ended, instead of ending there. Another blogger noted (and if this looks like your comment, give me a shout, because I've forgotten where I read it) that Geoff Johns engages in a little revisionist history here, when Batman tells Superman--my favorite line--that the last time he inspired anyone was when he was dead. In the DCU, probably not really the case. But it's arguably true in our world, and if Johns can address that, I'm all for it. But having the Golden Age Superman come back to tell our Superman what's what doesn't seem to me the way to do it. Again, it all feels a little set up--Wonder Woman needs a stern talking-to because she killed Maxwell Lord, but the staff behind Infinite Crisis had Wonder Woman kill Max so that they could have her get that talking to. It's not cause-and-effect. Knightfall, in contrast, was an actual treatise on the darkening of super-heroes; Infinite Crisis is darkening for treatise's sake. I sound like I didn't like it, and I did. It was a good set-up first issue. Phil Jimenez' art was beautiful, the dialogue snappy, the violence shocking--and half a dozen pages of the Big Three just talking is well overdue. And I've yet to see anyone comment on Johns' choice of villain for the DC Trinity to fight. Mongul is a perfect ironic choice, a symbol of Superman, Batman, and Wonder Woman's perfect unity way back in Alan Moore's "Man Who Has Everything." Icing on the cake would've been Superman looking Mongul straight in the eye and saying "Burn." But we can't have everything. My expectation is, Infinite Crisis isn't about what you think. Sure, the Pre-Crisis Superman and Superboy are on their way back, but we still have six issues left, and an event that will shock the DCU such that we'll pick up with them one year later. The multiverse may be back, but I don't think that's all. Thanks for reading. A Batman: War Games Act Three review coming soon. Ta! Well, I don't know if I'm the blogger you read, but I did mention the stupidity of Batman's insult here. And I do agree with you regarding the writers darkening the DC Universe in order to criticize the darkening of the DC Universe. It's like a crazy self-feeding loop. Glad to see you trying out the experiment. I enjoyed the first issue, but I agree, a DCU newbie wouldn't have a clue about what's going on. The art would look real nice though if they decide to Absolute it.